Molecular Biology of the Cell is the classic in-depth text reference in cell biology. By extracting fundamental concepts and meaning from this enormous and ever-growing field, the authors tell the story of cell biology, and create a coherent framework through which non-expert readers may approach the subject. Written in clear and concise language, and illustrated with original drawings, the book is enjoyable to read, and provides a sense of the excitement of modern biology. Molecular Biology of the Cell not only sets forth the current understanding of cell biology (updated as of Fall 2001), but also explores the intriguing implications and possibilities of that which remains unknown. One cannot watch cells crawling, dividing, segregating their chromosomes, or rearranging their membranes without a feeling of surprise and curiosity about the mechanisms that underlie these processes. 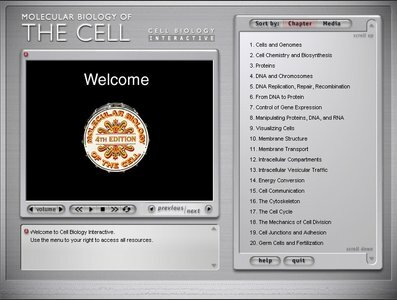 Included with every copy of Molecular Biology of the Cell, Fourth Edition, the Cell Biology Interactive CD-ROM provides students and instructors with a powerful tool for understanding and appreciating the remarkable dynamics of the microscopic and molecular world.